Callbacks are functions that are called in response to an event. The Paho client is designed to only use the callback functions if they exist, and doesn’t provide any default callback functions. However; it does provide a mechanism to set them. Assign the function to the callback. As an example we will use the on_connect callback. First I create my function. I’ve called it on_connect but I could have called it anything I wanted. The function simply logs a message, and sets a flag. Callbacks are dependent on the client loop as without the loop the callbacks aren’t triggered. Below is the code of a simple python script that creates a connection and then waits in a loop for the on_connect callback to be triggered. 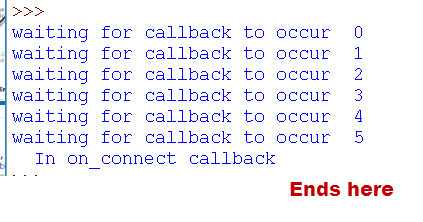 The on_connect callback then sets the flag that terminates the loop and the script ends. This means that if the callback isn’t processed then the while loop never ends as we shall see later. Here is the output generated by the script. Notice how the loop executes waiting for the callback and stops once the callback gets processed. 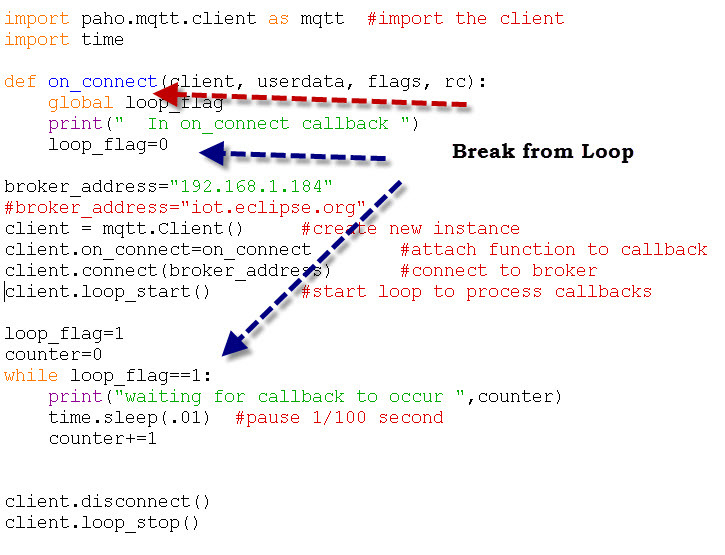 In the script above the client..loop_start() method starts a loop to process callbacks. So let’s run the above script again, but this time I won’t start the loop. To do that I simply comment out the client.start_loop() line. Here is what happens when I run the script. You can see that I had to manually terminate the script as it never processed the callback, and the callback is what terminates the while loop. If you dig into the Client code you will find the code for the Connect acknowledge message. When the client receives a CONNACK message the callback is triggered if it exists. Notice the if on_connect statement. This is what checks for the callback, and if it exists it calls the callback- self.on_connect(). The self.on_connect function is the function we assigned earlier using. You should see from the code that the function call passes several arguments, and so the function we create needs to be able to handle those arguments. If you use the loop_start() or loop_forever functions then the loop runs in a separate thread, and it is the loop that processes the incoming and outgoing messages. In this case the callbacks can occur any time in your script and are asynchronous. However if you call the loop() function manually in the script then the callbacks are synchronous with your script as they can only occur when you call the loop() function. Video- The Loop and Callbacks. 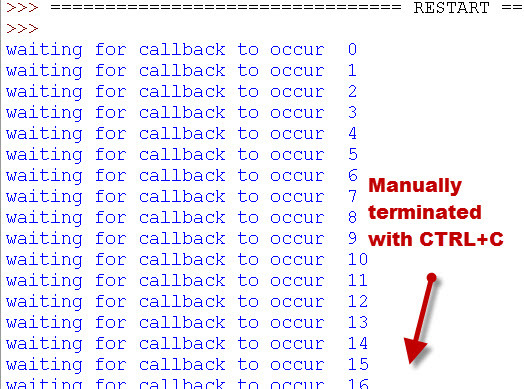 Due to the way they operate It is not possible to return values from a callback using the standard return command. Therefore if you need to get status information from a callback you need to use some form of global variable in the callback. If you refer back to the on_connect call back example I used the connected_flag which is a property of the client object. Because the client object is available throughout the script it can be accessed anywhere in the script. In my scripts my general approach is extend the main mqtt client class with flags and other variable I need. When I create client object it has these flags already assigned. Q- My callback is not being triggered? A- Have you assigned the function to the Callback? Are you running a loop for that client? Q-My callback returns a value but I don’t see it? A- Because of the asynchronous nature of callbacks it doesn’t make sense to return a value from them. 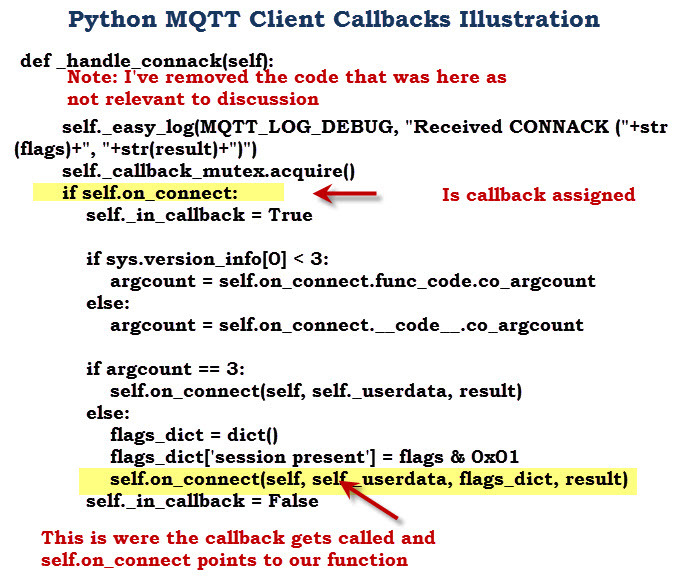 is there any difference between callback and callback function?does callback is the one on the left (client.on_connect) and the callback function is one we wrote? i believe on_connect on the left side and on the right side both are functions. so how is the flow here, i means from right side normally we do assignment. The callback function is just a python function. you cannot use the brackets on_connect() as this would invoke the function. Thanks Steve for answering here and in my email too. Thanks for your tutorial. I see you use a loop_flag which get a value within the on_connect function and then the value is used on the main program. I have tried to do the same. i.e. use a value changed within the on_message callback function. But it doesn’t work. From within the function, I can print the received value and it is ok. But when I print the value from other part of the program it does not have any value. I even used global to define the variables to be used within the callback function. The result is the same. Please help. I use the client object for the flag. This makes it available across the script. Note: bad connection flag aslo need to be set not shown above. To clarify. I am trying not to use flags or internally generated values like the clock. But to use values received from the outside via MQTT message within the script. An external clock for example, since the RPI will not be connected to the internet and therefore does not have a way of knowing the actual time. Currently I am receiving a value, lets call it external_value1. When receive this value, I add (or subtract ) a numerical value to it. My question is why I cannot see the values received within the script. Only inside the call back function. You are using global variables so you should be able to see them. However the general way of dealing with the messages is to drop them in a list or queue. You can then get the value anywhere in the script. The problem you might get with arrays is if they change while you are looping through them. Thanks. Firt, You help me made sure my procedure is as expected. I will go through it again. Hopefully I misspelled the name of a variable. – Something that has happened to me before, more times that I would like to admit. – Second, I would examine the usage of queues. It seems that is just what I need now. Thanks for you time, your kindness and your help. May you receive blessings. Thanks for the tutorial. I am trying to understand how the process of acknowledgement works in MQTT. Say, a publisher publishes a message with qos 1 or 2 and the subscriber receives the message. How will the publisher understand if the following message with msg ID is recieved by the subscriber? Is there any method to realize this functionality using on_publish callback method? Can I define my on_message callback with only message argument? No. The callback will pass all three arguments to your function. If you haven’t allowed for them you will get an error. Excellent; very helpful and clear.